May is #StrokeMonth- and by the time you finish reading this, someone's had one. It seems like the month of May has so many highlights and importance in Babushka's life. Of course there's Mother's Day, it's also National Mental Health Awareness Month and we all know how that's touched BB's life. It's also American Stroke Month and that too has significance. Less than a year ago mi querida MIL had a stroke. Luckily she was a nurse, on duty when she had the stroke and they recognized the signs immediately. Thanks to that and being of good German stock, she is doing well. But would we have been able to help someone- even ourselves if we had witnessed a stroke? 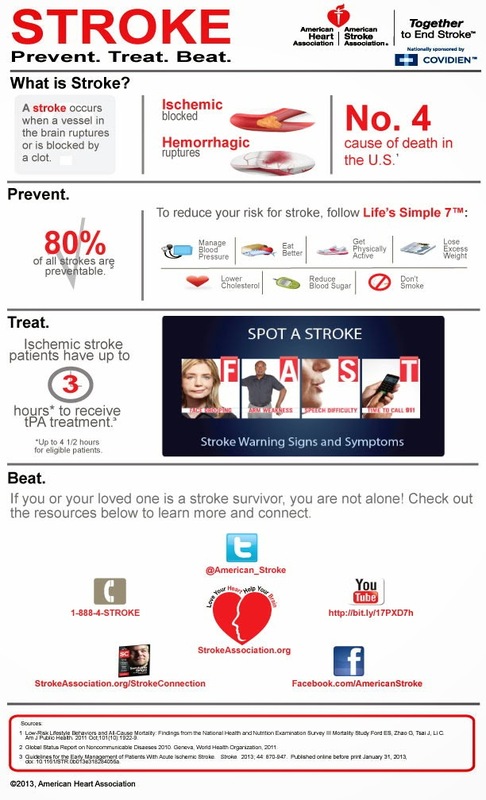 The above mentioned bullet points are pretty scary- especially the fact that "Stroke is the No. 1 preventable cause of disability". • Someone in the U.S. has a stroke about once every 40 seconds. • Stroke is the No. 4 cause of death overall, killing more than 129,000 people a year. Stroke is the No. 3 cause of death for women and No. 5 cause of death for men. • Stroke is the No. 1 preventable cause of disability. • About 795,000 people have a stroke every year. • An estimated 6.8 million Americans 20 and older have had a stroke. 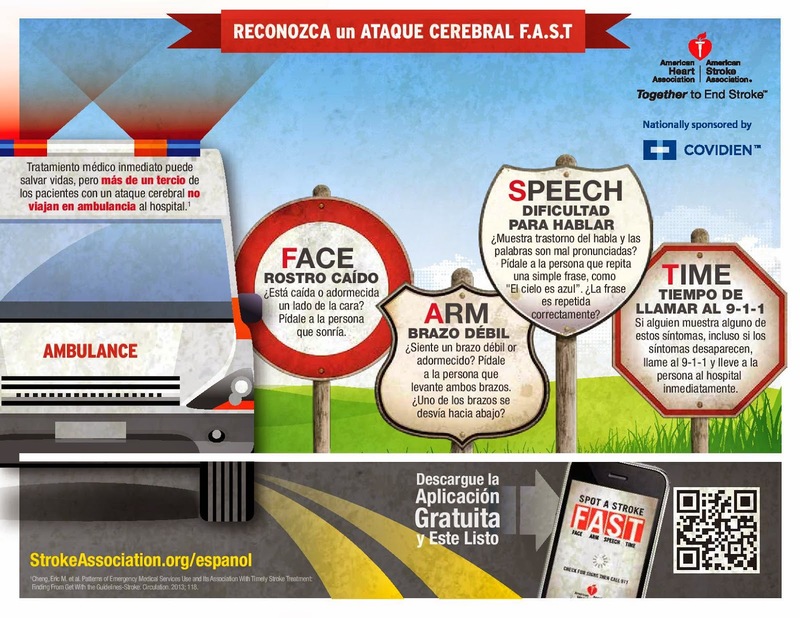 "The American Heart Association/American Stroke Association and the Ad Council to raise awareness about F.A.S.T—an acronym used to recognize a stroke and what to do in a stroke emergency. • F - Face Drooping - Does one side of the face droop or is it numb? Ask the person to smile. • A - Arm Weakness - Is one arm weak or numb? Ask the person to raise both arms. Does one arm drift downward? • S - Speech Difficulty - Is speech slurred? Are they unable to speak, or are they hard to understand? Ask the person to repeat a simple sentence like: “The sky is blue.” Is the sentence repeated correctly? • T- Time to call 9-1-1 - If the person shows any of these symptoms, even if the symptoms go away, call 9-1-1 and get them to the hospital immediately. When you recognize a stroke and immediately call 9-1-1, the person has a greater chance of getting to an appropriate hospital quickly and being assessed for treatment options like a clot-busting drug and other medical devices. But many people do not know the warning signs of a stroke – information that may save a life." • One in three Americans can’t recall any stroke warning signs. • According to a survey, Hispanic women are less likely than others to know most of the warning signs of a stroke – 25% did not know any, compared to 18% for whites and 19% for African Americans. • In a study of patients who had experienced a stroke, someone other than the patient made the decision to seek treatment in 66% of the cases, or every two in three. So there you have it My Beautifuls- the importance of May. And the importance of recognizing the signs of a stroke.